There’s a real Katy behind KatySweet. 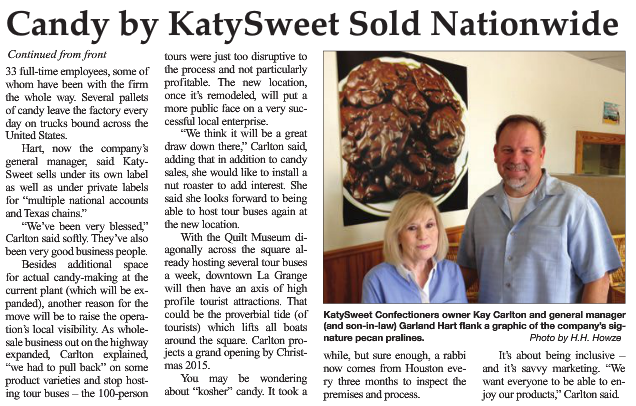 KatySweet started - like so many food companies - in our founder’s home kitchen. Kay Carlton had a family recipe for Texas-style pecan pralines passed down from her grandmother. At every special occasion, Kay found herself making batches of creamy pecans pralines for friends and family. 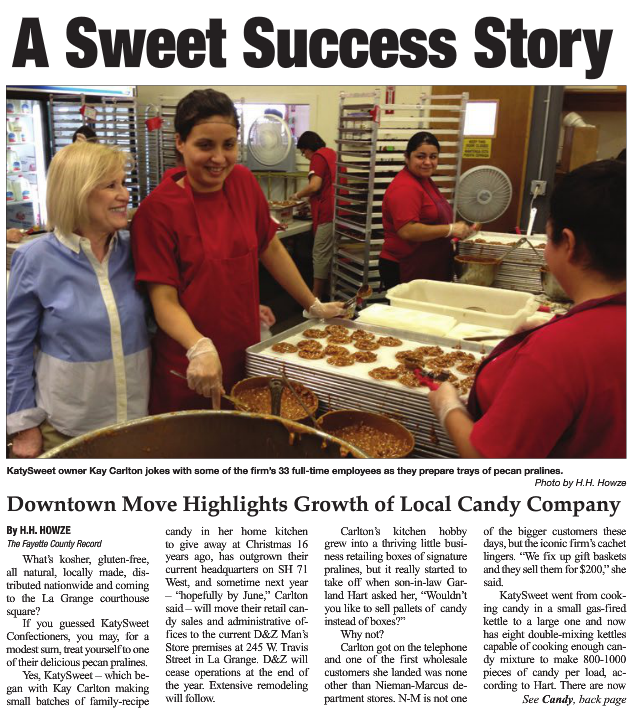 In 1995, Kay decided to combine her love of business with her love of candy and founded KatySweet. One year later, she outgrew her home kitchen and moved into her first “real space” - a former bank building located on the square in La Grange. She and her staff converted the bank into a commercial kitchen, storing chocolate in the old bank vault - the coolest spot in the building. Every afternoon, the smell of cooking sugar, pecans, and vanilla would waft across the square, drawing in locals wanting the very freshest pralines, still warm – straight from the kitchen. Word got out – and five years later Kay built a new commercial kitchen, designed from the ground up to produce the original family recipes using Kay’s time-tested method. To this day, we still use the best ingredients - so we can continue to make Kay’s recipes without losing the homemade taste and quality that got us started. When you bite into one of our Creamy Original Pralines or Chewy Pralines, you taste the finest ingredients and the care that goes into making every piece. We deliver our products to more than 4,000 retail and wholesale locations all across the U.S. In 2016, we added an additional 24,000 sq. ft. facility to meet current and future production demand.